Home » General » How Business Security Pays For Itself? Every business owner aspires a safe and sound experience for the employees and the customers visiting the organization. Security inside the premises plays a vital role in running a successful business. Equipment of extensive security measures demands certain financial approvals from the responsible members of running the business. As the main motive of every business owner is to serve better and earn profits, security is often neglected or not given immediate priority. This will mainly result in physical security breaches and misuse of personal information. However, compromising security can be disappointing for the staff members and the valuable customers that further affects the reputation of the brand. Therefore every business owner should definitely understand the importance of security and deploy upgraded devices such as visitor management systems as their first line of defense. These virtual access control systems help to maintain security inside the premises of an organization as well as check-in guests smartly at the front desk. Equipping one of the best visitor management systems will protect the staff employees from any external harm and the customers to register seamlessly. 1) Limited and marked points of entry: Authorizing specific doors for entrance purpose of staff and customers will restrict entry of any unauthorized person. It will otherwise impress your guests as they will be aware of the entrance and the exit points. 2) Digital Visitor management policy: Equipment of visitor management system will ensure screened and registered entry of every intruder smartly on a compact tablet device. 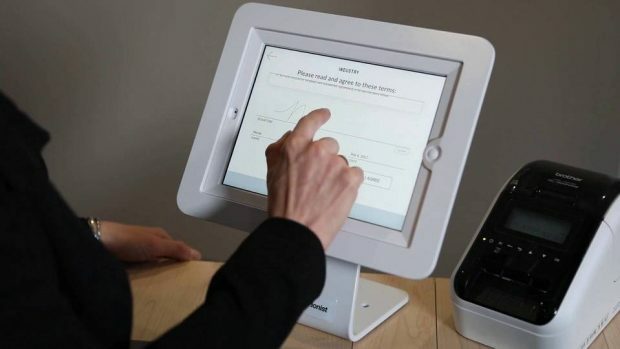 It is also capable of capturing visitor information, photographs &digital signature for the legal documents. 3) Identity badge: Visitor management systems after enrolling the customer information, prints unique customized badges that display important details such as contact information and photograph. This policy of badging reduces the threat of any external harm and chances of confusion between the guest and the host. Every person that enters is provided an identification badge that helps the in-house employees to easily identify their guests. 4) Visible bright points of entrance: Eliminating dark and low visibility spots will ensure that the CCTV cameras or the physical security guards record entry of every intruder that can be helpful for later verification at any point of emergency. 5) Safe record keeping policy: Equipment of visitor management system will automatically ensure the safety of visitor logs. Whenever the authorities need the information can only be accessed by logging into the admin portal of the application by providing user credentials. These logs are very helpful to determine customer trends and drive meaningful insights for the business. Because You Embarrass Them: 5 Activities That Will Make You The Cool Parent As a parent, it can feel like your job is to embarrass your children.